Although a garage door system is comprised of a variety of different components, one of the most important ones are the tracks and the cables. These two different parts work in tandem and are in charge of guiding the door's movement and lifting it up and down. Just like any other hardworking component, they can be affected by wear and tear damage, and their condition will most likely degrade over time. That's why it's important to have a professional take care of them on a regular basis, or at least when something goes wrong. The entire weight of your door can come crashing down when these components are mishandled, so you should always get one of our experts to perform whatever task you need doing. Checking the condition of both the tracks and the cables on a regular basis will help you know when their condition is getting a little too worse for wear. But to really make a difference in their performance and longevity, you'll want to have our technicians inspect them periodically. We'll lubricate the cables and the rollers, and repair bent tracks or clear them of any debris that may prevent your door from moving smoothly. Some situations merit urgency. 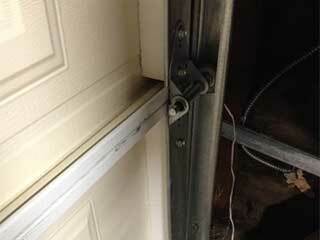 If your cable snapped or got off the drum, for example, you probably won't be able to use your door. Not only that, but the panels may even collapse or slam shut, which can be incredibly dangerous by itself. Count on our team for help when that happens. We specialize in solving these types of scenarios without compromising the safety of anyone involved. Any component that plays such a pivotal role in the operation of your door is likely to be under a great strain and could be potentially extremely dangerous. That's why professional assistance is always required. Sometimes a problem can become so severe that replacing the tracks and cables is the only way to proceed. We can help you with that type of task as well, and our technicians will perform the necessary work carefully and quickly. No matter what type of door you have, or what kind of issue is affecting its performance, you can always rely on our experts at Garage Door Repair Scarsdale. Call us today.